"Crack" is the street name given to cocaine that has been processed from cocaine hydrochloride to a free base for smoking. 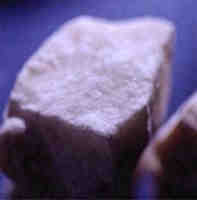 Crack cocaine looks like white to tan pellets or chunks that resemble rock salt or soap. Rather than requiring the more volatile method of processing cocaine using ether, crack cocaine is processed with ammonia or sodium bicarbonate (baking soda) and water and heated to remove the hydrochloride, thus producing a form of cocaine that can be smoked. The term "crack" refers to the crackling sound heard when the mixture is smoked (heated), presumably from the sodium bicarbonate. There is great risk whether cocaine is ingested by inhalation (snorting), injection, or smoking. It appears that compulsive cocaine use may develop even more rapidly if the substance is smoked rather than snorted. Smoking allows extremely high doses of cocaine to reach the brain very quickly and brings an intense and immediate high. Crack is nearly pure cocaine. The Drug Enforcement Administration estimates that crack rocks are between 75 and 90 percent pure cocaine. Dosages of crack are smaller, meaning there is no need for diluting the cocaine with various substances. Because of the smaller dosages, crack is more profitable for the dealer. The smaller dosage units also mean it is cheaper for the user to purchase a small amount and get high. The cheaper price per unit also makes it available to broader market. But there is a greater asset crack provides for the dealer. Crack cocaine can be instantly addictive. Cocaine base (including coca paste, freebase cocaine, and crack cocaine) typically is smoked in pipes constructed of glass bowls fitted with one or more fine mesh screens that support the drug. The user heats the side of the bowl (usually with a lighter), and the heat causes the cocaine base to vaporize. The user inhales the cocaine-laden fumes through the pipe. Alternatively, crack cocaine can be sprinkled in cigarettes and smoked. Usually the crack is ground up and sprinkled into a marijuana joint and smoked. These cocaine laced joints are referred to as primos. Cocaine base (including coca paste, freebase cocaine, and crack cocaine) typically is smoked in pipes constructed of glass bowls fitted with one or more fine mesh screens that support the drug. The user heats the side of the bowl (usually with a lighter), and the heat causes the cocaine base to vaporize. The user inhales the cocaine-laden fumes through the pipe. Alternatively, crack cocaine can be sprinkled in cigarettes and smoked. Usually the crack is ground up and sprinkled into a marijuana joint and smoked. These cocaine laced joints are referred to as primos. The vapors of the freebase are absorbed through the lungs into the bloodstream and transported to the brain within 10-15 seconds. One inhalation will produce a degree of intoxication usually lasting 10-15 minutes. While smoking remains the predominant route of crack administration in Pulse Check cities around the country. However, some sources indicate that crack is also sometimes injected or snorted. In some cities, crack is combined with other substances and injected. For example, in Washington, DC, it is reported that crack is combined with heroin and marijuana and then injected. Also, in New Orleans, crack is injected with heroin in a "speedball." Crack is just another form of Cocaine Hydrochloride. Crack came about in the early 1970s by the American dealers, they found it by chance. They placed cocaine on tin foil and then burned is to test the purity of the cocaine. 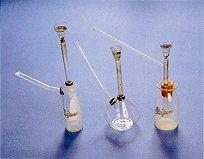 They would then sniff the vapors; this led to the birth of crack cocaine. Crack is probably the strongest drug available to become addicted to, it is easy to see why. Most people become addicted to crack cocaine because of its power. Every user will tell you the first buzz is the best and every user will search for this over and over again, with no success. The drug will become part of your life and you will feel that after time you can not function without it. It will come before everything in your life, even your children or family. Crack will not only take your money but could cost you your job, your savings, your belongings and most importantly your family and your soul. Because Crack Cocaine isn't bias of whom or what you are, it will make you sell your soul just for just one hit. Financial and legal problems: rent arrears, checks are "lost or stolen"